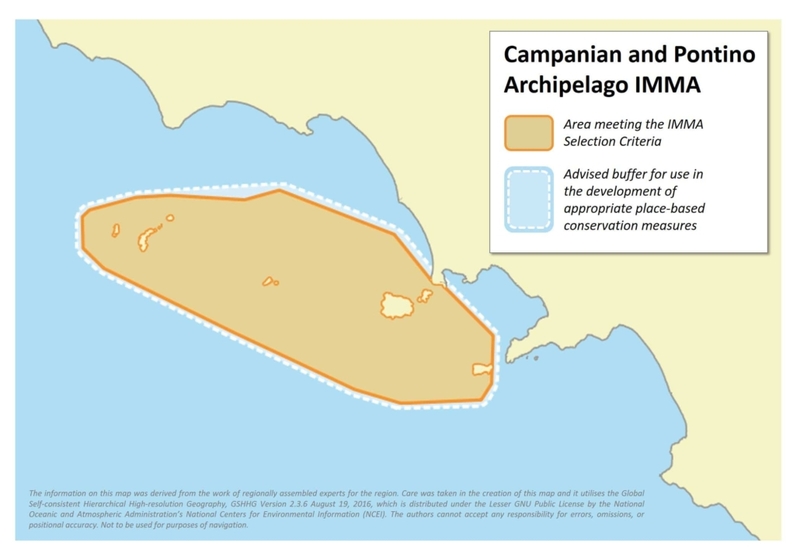 The Campanian and Pontino Archipelagos is an important habitat for Endangered Mediterranean sperm whales (Physeter macrocephalus). Groups of solitary males, loose male aggregations, bachelor groups, and social units of females with immature whales have been observed to coexist in the area. Approximately 60% of the identified individuals have been observed to return to the archipelago, being re-sighted sometimes a year apart, showing site fidelity. This area has also been identified as a feeding site, the complex topography of canyon systems being a driving factor shaping the species’ presence and distribution. The IUCN Red List classifies the Mediterranean subpopulation of sperm whale as Endangered and infers that their numbers are declining from significant anthropogenic threats. These whales are likely to be genetically isolated from the Atlantic population. The species is subject to several threats including bycatches in fishing gear, ship strikes, disturbance, noise and chemical contaminants with several potential negative effects at the population level. Data collected on sperm whale breeding and calving has observed 8 social units out of 142 encounters recorded in the area. Despite the low number of social units seen during the 2000-2016 period, their presence in the area was concentrated in autumn (October, November, and December), in which newborns were observed. Data collected on feeding behaviour show a total of from a total of 251 hours of audio recordings sperm whales in the area spent the majority of the recording time (both entire and partial dive cycles) in searching activities (72.51%). This behaviour included the usage of Usual Clicks (UC) with some pauses between sequences. Whales’ searching activity in the area occurred over a wide range of depths and at any stage of the dive. Feeding activities (assessed measuring creaks, CR) comprised 5.75% of the time, as well as a mix of searching-feeding activities (5.23%, combined acoustic behaviour). The mean number of CR per dive was lower than the values found in other studies, and about 30% of the dives were not associated with any creaks. Searching and feeding hotspot maps obtained with the acoustic tracking indicate higher activity at depths deeper than 500 m, near the main canyon heads. Azzali. M., Impetuoso, A., Mussi, B., Miragliuolo, A., Battaglia, M., Antollovich, W. 2003. Analysis of acoustic signals emitted from a nursery school of sperm whale (Physeter macrocephalus) recorded off Ventotene Island (Southern Tyrrhenian Sea, Italy). European Research on Cetaceans 17: 22-25. Mussi. B., Miragliuolo, A., Zucchini, A., Pace, D.S. 2014. Occurrence and spatio-temporal distribution of sperm whale (Physeter macrocephalus) in the submarine canyon of Cuma (Tyrrhenian Sea, Italy). Aquatic Conservation: Marine and Freshwater Ecosystems 24(S1): 59-70. Pace, D.S., Miragliuolo, A., Mariani, M., Vivaldi, C., Mussi, B. 2014a. Sociality of sperm whale off Ischia Island (Tyrrhenian Sea, Italy). Aquatic Conservation: Marine and Freshwater Ecosystems 24(S1): 71-82. Pace, D.S., Mussi, B., Gordon, J., Wurtz, M. 2014b. Foreward. Aquatic Conservation: Marine and Freshwater Ecosystems 24(S1): 1-3. Pace, D.S., Mussi, B., Airoldi, S., Alessi, J., Arcangeli, A., Atzori, F., Azzolin, M., Campana, I., Celona, A., Fiori, C., Giacoma, C., Gnone, G., Luperini, C., Mangano, R., Miragliuolo, A., Moulins, A., Nuti, S., Pellegrino, G., Rosso, M., Salvioli, F., Tepsich, P., Tringali, M. 2015. New insights on the presence and distribution of the endangered short-beaked common dolphin Delphinus delphis in Italian waters. Biologia Marina Mediterranea 22(1): 262-263.